Every month, BCO picks a ‘new and hot’ Houston restaurant to satisfy our high-maintenance taste buds! And, even better than the food and cocktails you’ll discover, is the opportunity these dinners give you to catch up with new BCO members, old BCO friends and any interesting guests that get dragged along for the ride. This month, we’ll be heading to Punk's Simple Southern Food for some finger-lickin' good classic southern dishes! If it's good enough to satisfy the Houston Texan's line, it will be good enough for you! Our foodie nights are all about the food! 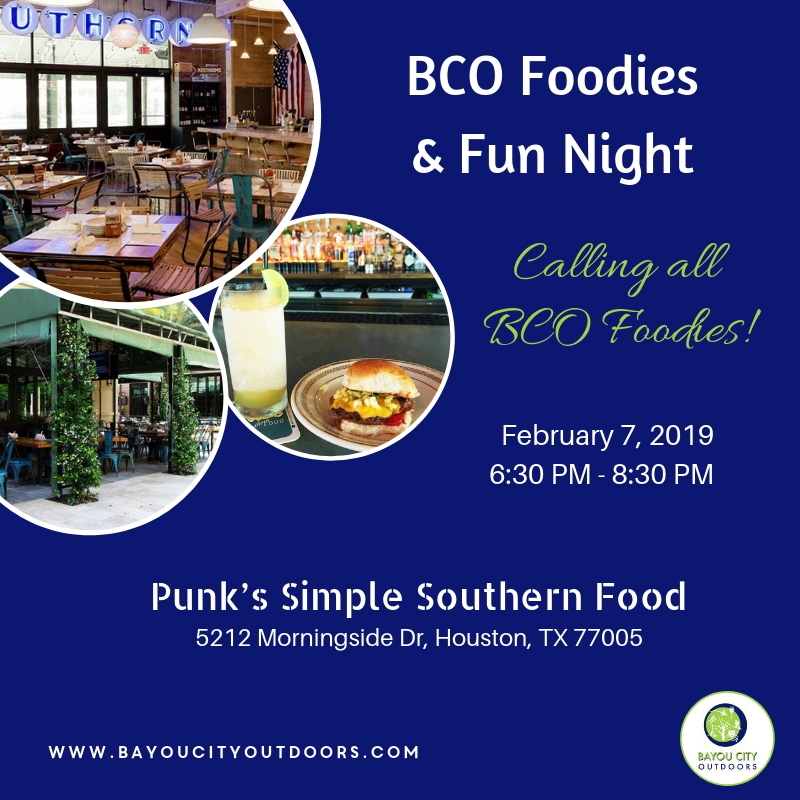 Join your fellow BCO food aficionados for a casual night of socializing and just getting to know each other, and better yet, getting to know Houston’s best food. No presentation, we promise! Whether you love hiking, biking, kayaking, camping, backpacking or just being social, we promise you’ll meet some kindred spirits at this monthly dinner. A little shy… don't worry! Our Event Leaders will be there to break the ice and to answer any questions you might have about BCO in general. We'll chat about upcoming adventures, Houston bike rides, hikes and fun to be had. As always, look for the white and green Bayou City Outdoor sign and you’ll know you are in the right place. Parking is in the lot and on the street.